This is a Systems Model for the gold medal-winning machine 'ElectrEcoBlu' produced by the team from Glagow University for the iGEM 2007 competition. Details about the project can be found here. 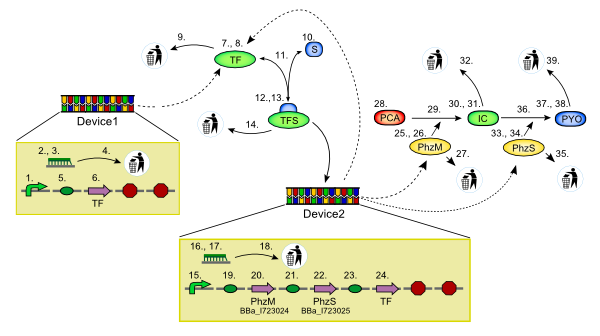 Device 1 produces TF via a constitutive promoter, which combines with S to form a transcription factor for Device 2 (TFS). TFS produces PhzM and PhzS, intermediates to producing PYO which is the reducing agent of interest in this model. There are two versions of this model, the first has a positive feedback loop from Device 2, shown as a CDS for TF downstream of Device 2's promoter. 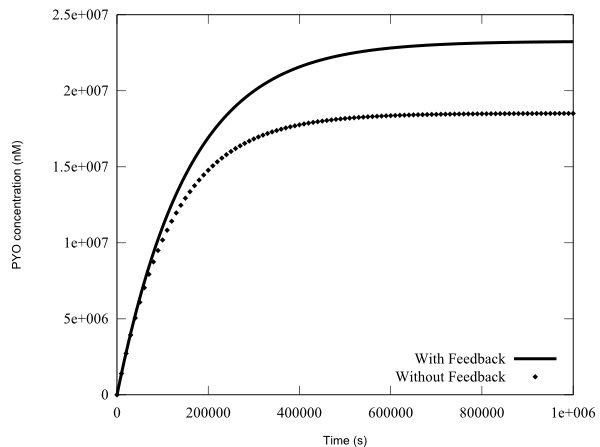 Thus Device 2 produces more TF which feedsback on the Device's promoter. The second version does not have the RBS and CDS for TF in Device 2. The Figure below shows the PYO time-courses for the models, one without the TF feedback, and one with. The CDS for PhzM (number 20. above): Part BBa_I723024. The CDS for PhzS (number 22. above): Part BBa_I723025. Derived from workspace ElectrEcoBlu Standard Virtual Biological Machine at changeset 4b94a84601bc.